Cherry and Spoon: Fringe Festival: "The Finkles' Theater Show!!" Title: The Finkles' Theater Show!! Summary: Theater novices Carl and Wanda Finkles enter a festival and put on a show. What they lack in theater know-how they make up for with boundless enthusiasm. Highlights: Ryan and Rachel have created something pretty clever here - a show within a show, in which their characters are putting on a show about putting on a show (think [title of show], only more absurd). The charmingly awkward Finkles (Finkleses?) walk us through their journey of finding out they made it into the festival, holding auditions, rehearsals (complete with instructions on what differentiates good theater from great theater - don't break that fourth wall! ), a big dance number (which starts out silly and peppy and slowly disintegrates as the Finkles tire when the chorus of "Holding out for a Hero*" keeps repeating and repeating), all the way through to show night, when everything comes full circle. It's all very meta. 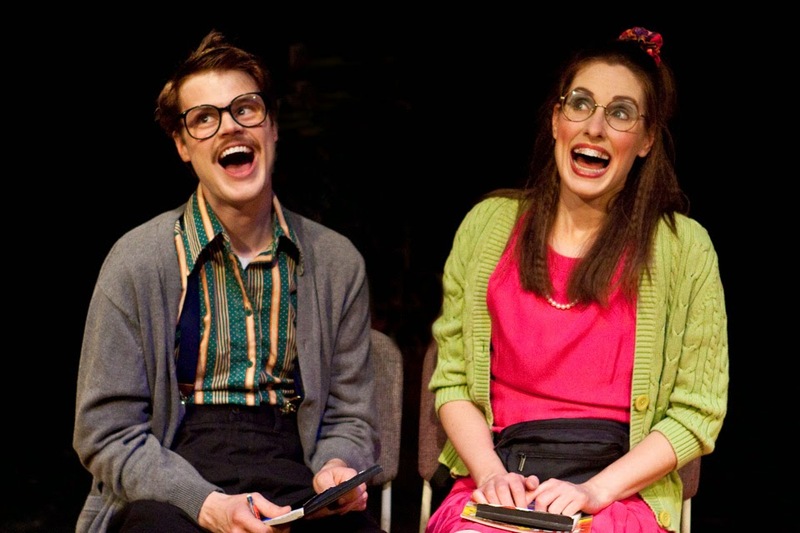 But while Carl and Wanda may be theater amateurs, Ryan and Rachel are professionals. Ryan is a master at facial expressions and body language; I would happily watch him wordlessly contort for 60 minutes as his character goes through a range of emotions. Rachel is a great match and perfectly completes the odd couple, and has a surprisingly lovely voice that doesn't quite fit with the Wanda we come to know. This could be the most brilliantly awkward 60 minutes of theater you'll see this year. *I was quite amused that the Finkles' dance move for "he's gotta be smooth" is shaving their armpits, considering the show I had seen just previously.